G Stanley & Son Ltd.
G Stanley & Son in Clifden, County Galway, is a sixth generation family-run business, steeped in heritage the shop has been in operation since 1824 when the town of Clifden just began. Stanleys shop originally opened in 1824 and we have been here ever since. 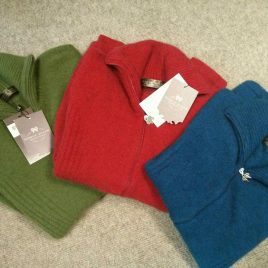 We cater for a wide range of tastes and products, supplying the best quality knitwear and wool products on the market. Stanleys specialises in a variety of Irish wares, such as hand-woven tweed jackets, Irish knitwear, rugs, scarves, ties as well as footwear, outdoor clothing, sportswear and fishing tackle. Along with selling a selection of angling and fishing equipment, the store is also the go-to place for licences and permits for fishing in the area.